[eGuide] Host the event of the season! Want to know how to create an "event of the season" that'll be on everyone's must-attend list? Fundraising events are a nonprofit mainstay, but they take a lot of time, effort, and money to produce. Between venues, catering, invitations, and entertainment even the most basic event can run tens of thousands of dollars to produce. That's why it’s important to create an event with your donors in mind. Make the most of your resources and create an event your supporters will be talking about all year! Create an event that fits your goals. Secure RSVPs and ensure guests show up. 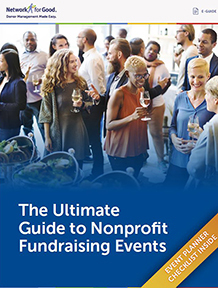 Raise more money before, during, and after your event. PLUS! A Post-Event To-Do List that will keep your guests engaged long after the festivities have ended.